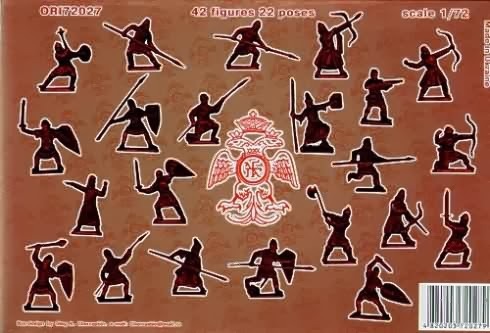 Today we talk about.... the Byzantine Infantry from Orion, a set that most probably filled the most important army in history without 1/72 representation. Does it convincingly fill that gap, or it is a insult to our beloved Byzantines? Discover it in this review! Following the unique Orion style, the artwork is a bit strange, just showing three men of a set with many different types of soldier.This is not a very good choice. It seems a strange 60s poster. Behind, we are shown the silhouettes of the soldiers, because it is impossible to see anything else with such dark pics of the soldiers. It is even wrong in listing the quantity, as instead of 42 figures, there are 44, so this box averages quite bad. Something went wrong with this set. The sculpting is good as with nearly all Orion sets, with lively poses, and very good proportions, but the flash is present nearly everywhere, the spears are bad jokes, they have tempted me to substitute them all (and I am one of those non-perfectionists guys that would hardly even think of that possibility). The arrows of some archers are just a blob, and worst of all, two of the poses don't have a face. You will wonder then, what do they have then? My best bet is a sort of monstruos scarred flat face. (the italian hand-gunner and the man pointing down his spear). So congratulations to the sculptor, and death to the productor/technician that made the moulds. I cannot give more than a 6, even if the sculptor's job was good, the product was quite spoiled. 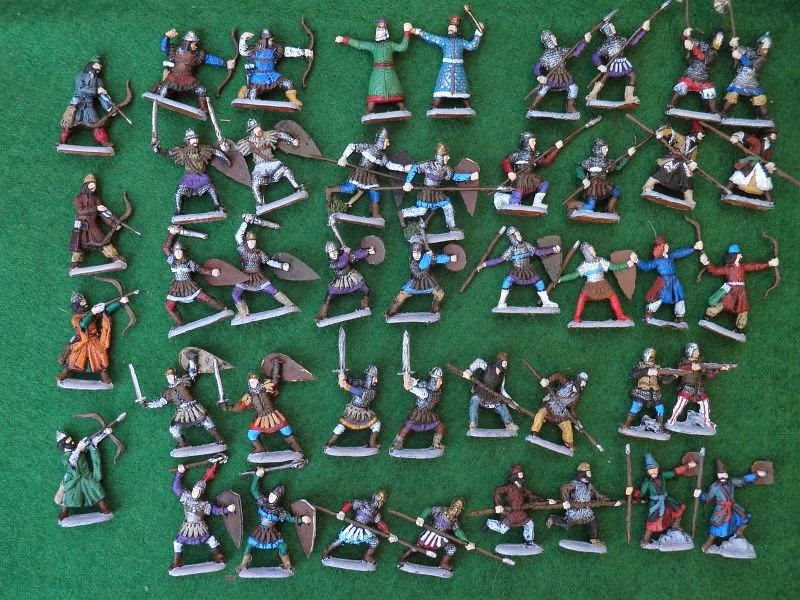 I think that you can be lucky and get a better set, with less flash and maybe the face of the spearmen, but from what I have seen, the spears and the hand-gunner face are lost forever. Orion has just copied many plates of Osprey books, like other companies, but this time, without hardly reading anything of the book nor researching the most minimal reference outside those plates. The Albanians and Bulgars should be cavalry, but as depicted in the plates they were dismounted, so they have been done like this. There are other small problems of accuracy, but these could be passed over as not very important. The native Byzantine Infantry is hardly usable for anything else (except probably the spearmen without a shield that could be of any Medieval Kingdom), and you would have to convert them slightly, which I hardly see the point of,there being so many medieval troops. 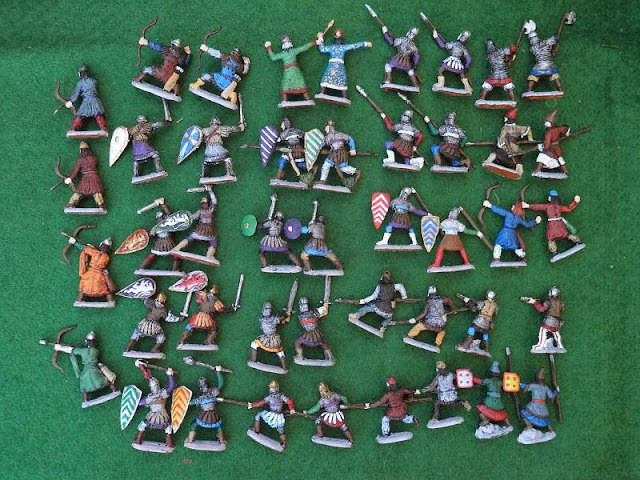 But then here come the auxiliaries, which are nearly the 40 % of this set. There are Cumans, Almughavar and Venetians, which could have a lot of uses; the Almughavars as any barbarian or mountain tribe, the Venetian as any medieval hand-gunner, and the Cumans as any nomadic faction. The regular Byzantines are quite dull (except the officer, which is a fun addition, although he is wearing a court fine dress, and wouldn't be dressed like that in battle, we can consider he is defending a city, something which the Byzantines did quite a lot in these eras, and he hasn't had time to change his garments) but then there come the auxiliaries. I consider it a great idea having done Albanians, a very interesting and obscure subject, and the first representation of the Almughavars, the famous catalan mercenaries of Roger de Lluria, which after his death at the hands of the Byzantines, assaulted various cities in Greece and founded a small principate that lasted roughly 50 years. Both Almogavars use a spear, but at least they should have been given a pose with a short knife, which had made them famous, as they used one to stab the stomach of the enemy horse, and then to finish off the knight once on the floor. The ratios and proportions of men are strange and hardly good. First, it should have a proper military commander, not just a court dignitary for defence. 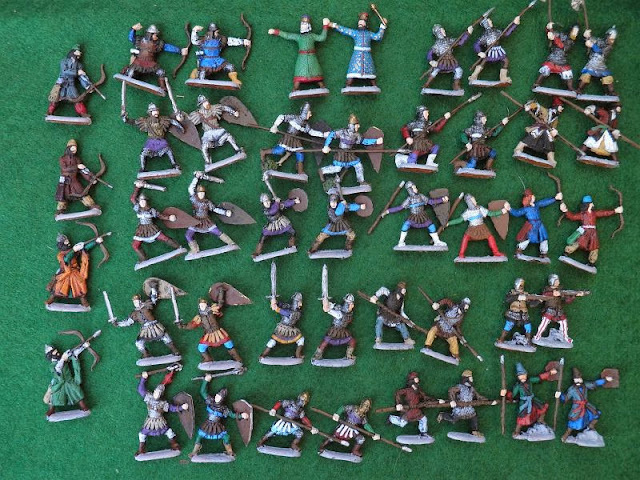 They completely lack Byzantine light infantry, which I suppose you are intended to draw from the other two sets that Orion produces of earlier Byzantines, but they would have changed a bit and it is not a 100 % fulfilling solution. All the native Byzantine infantry are heavily armoured and many of them wear a sash on their chest, which was used to show the rank, and so they are officers. Their average cost is 10 € shipped, which is good. I bought this set in a heartbeat, I would have probably bought just about any set that had "Byzantine" in it's title. 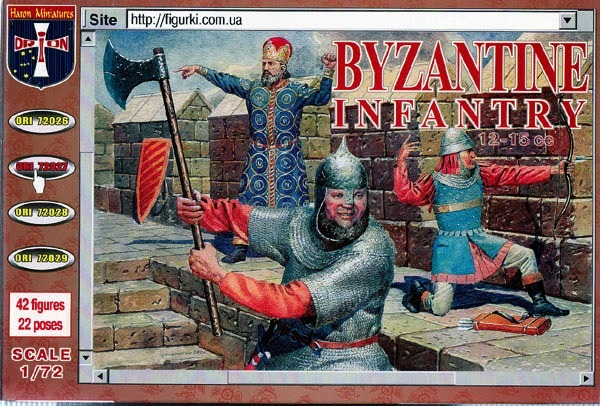 At first I complained a bit, as it isn't a very representative set for the Byzantine Empire, but with the later releases of the two other earlier sets, it is a very nice addition. When they first appeared, I would have paid the double to have them, to soothe my Byzantine soldier' thirst.